Neuromuscular Function and Disorders focuses on the various processes underlying disordered neuromuscular function. Topics covered include the nature of membrane defects in myotonia and familial periodic paralysis; the disorder of neuromuscular transmission responsible for myasthenia gravis and the various pseudo-myasthenic syndromes; and the disorders of Schwann cell function which cause demyelination. This book is comprised of 28 chapters divided into two sections and begins with a discussion on the normal anatomy and physiology of peripheral nerve and muscle. Included in the first section are descriptions of the ionic mechanisms responsible for the resting and action potentials of nerve and muscle; the sequential stages in neuromuscular transmission; excitation-contraction coupling; the sliding filament mechanism of myofibrillar shortening; and the morphological and functional properties of motor units. The neurophysiology of exercise and muscle fatigue is also considered, along with the nature of the trophic influences exerted by the motoneuron and muscle fiber upon each other. The second half of the book deals entirely with various diseases of peripheral nerve and muscle, together with diagnostic procedures and therapeutic management. 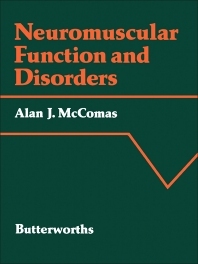 A consistent theme in this section is the recognition of neural abnormalities in diseases hitherto considered as primary disorders of the muscle fiber. This monograph should be of value to neurologists, medical students, research workers, and students and research scientists in physiology, zoology, pharmacology, kinesiology, and physical education.